What is this...err, foggy line on the back of this fly? is this the lens, lighting, shadow, err, wrong aperture, or some real fog on its back? but that seems weird to me. Some suggestions of what might have gone wrong? Clearly, your photographic equipment is broken. Send it to me! 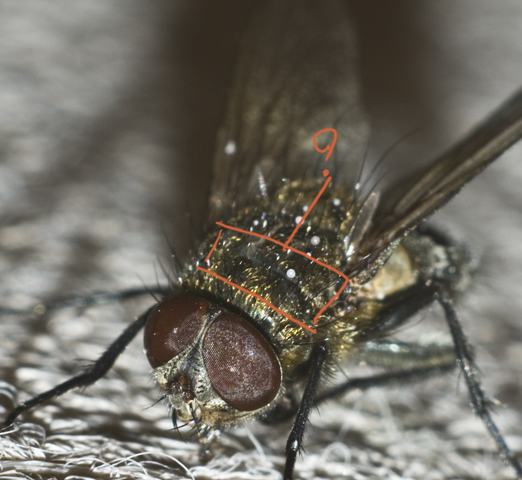 Maybe just some reflection or refraction due to the sheen of the fly. flippedgazelle is right, same reflection is on the left eye of the fly. aaah. is that what that is? thanks i couldnt figure it out, and it bothered me a little at the larger size.